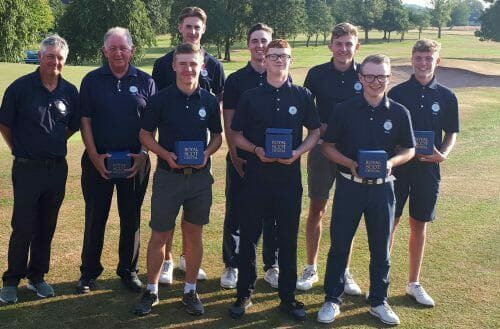 For the third successive year the Yorkshire Boys led by their Manager Phil Woodcock, retained the England Golf Northern Qualifier which was played at the Lancashire inland course of Pleasington GC. The course was tinder dry and hard, due to the long spell of hot, sunny weather the country has been encountering over the recent weeks. Players had to adapt to these very tough and difficult conditions, conjuring up varying shots to seek out the pars and on some holes bogeys! Yorkshire got off to a disappointing start with two players, Ben Schmidt and Callum Macfie being seven over and ten over after 9 holes respectively. However, Ben made a tremendous comeback on the back 9 with four birdies to complete his first round in 74, an excellent effort. Callum however, continued to struggle but managed to steady the ship finishing with an 85. Michael Hay struggled in the early stage to come home with a 79. George Heath and Charlie Daughtrey battled away bringing home a couple of 75’s. Barclay Brown, our anchor man played controlled golf all the way round and was rewarded with the best morning score of the tournament, a 67. At one stage he was 5 under, but unfortunately due to a hard bounce on the par 3 sixteenth hole, he had to settle for his only bogey! At lunch we were six shots off the lead set by Cheshire playing some great golf, their five-man counting score being 9 over par. Over lunch our coach, Steve Robinson and I suggesting they needed only to play steady golf, sticking to our game plan, especially in view of the very hot and dry conditions. Ben was first out again and was 2 over after 3 holes, same start as the morning, but he then went on to play some good golf being no worse than 1 over until he reached the 17th and 18th, where he dropped a shot on each to finish with another 74. Callum, Boys Captain got off to a terrific start with a birdie on the first hole, as he left the green with a beaming smile he commented: “I’m happier now!” He continued in the same vain and was level par after 16 holes, but again, like Ben dropped a shot on each of the last two holes to finish with a 74, no disgrace and much improved on his morning round. First two scores in as ordered. George had a solid start turning in 1 over par, but with dropped shots on 10 and 11 he then had to ensure not dropping many more, this he did in great style finishing with a 74, another good team score! Charlie encountered trouble in the middle of his round dropping several shots and unfortunately did not recover to post 82, which would be our dropped afternoon round score. Michael got off to a terrific start with a birdie at the first and fifth to turn in 2 under, but then dropped shots on the back 9 to finish with a 75, but again this was asked of him for the team. Barclay dropping a shot on nine to go out in 2 over, but back to 1 over with a birdie on the par 3 eleventh. A double bogey on 13 moved him to 3 over, but his determination once again paid off with two superb second shots to within inches and a few feet on 14 and 15 respectively rewarded him with two birdies to go back to 1 over. Another dropped shot came on the dreaded seventeenth for him to finish with a 73. Our five counting scores were 74, 73, 74, 75 & 73 for an afternoon total of 369, exactly what Steve and I were looking for to take victory away from Cheshire. This was a magnificent effort by all our team members, including Jack Maxey our seventh man who played a tremendous part in supporting the players during the day.